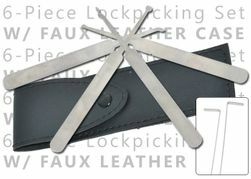 6 piece set(default choice) has 4 picks and 2 tension wrenches. All picks have metal handles. Comes enclosed in imitation leather pouch. Only $9.95. These are pretty effective for occasional use, but not made with the best materials, hence the cheap prices. We also have a Majestic 8 pc set that is pretty reasonably priced at 19.95. See the dropdown menu below to choose. No returns on lock pick sets.